Famela, 8, excelled at math and martial arts. Her sister, Fadhila, 12, was good at drawing. Firman, 15, was on the student council at the liberal Muslim experimental school they attended, and he had a soft spot for Taylor Swift. Yusuf, 17, liked to make videos and take care of his little sisters. All four children were seen as being astonishingly well-behaved and accomplished by their neighbors and friends in their multiethnic residential enclave in Surabaya, Indonesia’s second-largest city. They all wondered how the parents, Dita Oepriarto and Puji Kuswati, did it. But by Sunday morning they wondered if they had really known the family at all, after back-to-back bombings at three Christian churches. Famela, Fadhila, Firman and Yusuf blew themselves up in the attacks, as did their parents, killing 12 bystanders and wounding at least 40 others. To the end, the children were dutiful. Mr. Oepriarto set off a bomb in their family Toyota at the Surabaya Center Pentecostal Church. Around the same time, the teenage boys rode together on a motorcycle to the Roman Catholic Santa Maria Church, where they set off their explosives. The father massacred seven people; his boys killed five others. Famela and Fadhila detonated their explosives at the Indonesia Christian Church, one by one, before Ms. Kuswati triggered her own bomb. Their strike resulted only in their own deaths. 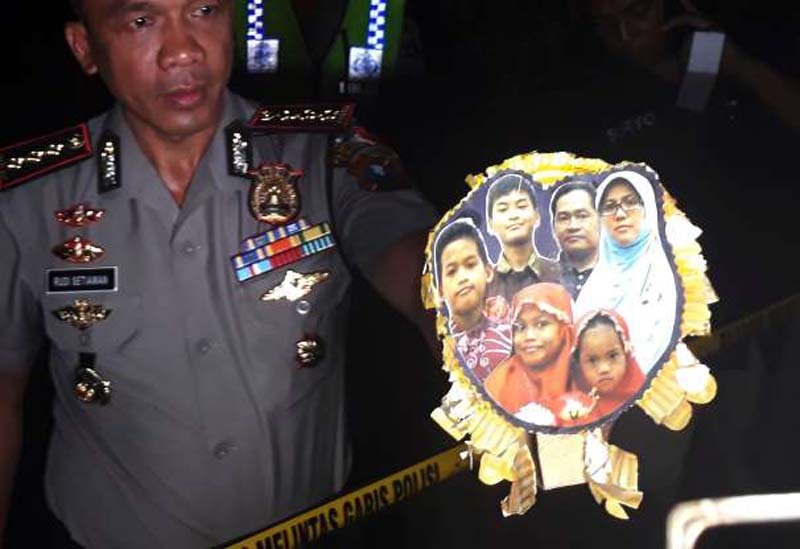 Adding to the horror, by Monday two other families had set off bombs and the police had found links to a sprawling terrorism plot centered on Mr. Oepriarto, 47. In the aftermath was the haunting question that mystified anyone who is a parent, as well as those who knew the families best: How could the conspirators have done this to their own children? In the case of Mr. Oepriarto and Ms. Kuswati, in particular, the family was known to be close-knit. The only explanation, it seemed, was that they believed martyrdom would unite them again in the afterlife. The alternative, having only Mr. Oepriarto commit jihad while leaving the rest of the household stranded among the living, may have been too hard a notion for the family to bear. Hours after the bloodshed, the Indonesian authorities identified Mr. Oepriarto as the head of the Surabaya chapter of Jamaah Ansharut Daulah, an Indonesian militant organization that has pledged allegiance to the Islamic State. The police are also investigating whether Mr. Oepriarto had any contact with the Islamic State’s remote terrorism planners in the Middle East. While Indonesia, the world’s most populous Muslim-majority nation, is hailed for its embrace of religious pluralism, the country also has a painful history of domestic terrorist attacks. And in recent years, the Islamic State has become more active here, starting with deadly suicide attacks in the center of Jakarta in January 2016. After the church bombings in Surabaya, the plots connected to Mr. Oepriarto were violently exposed. On Sunday evening in a working-class suburb of Surabaya, security forces rushed to the scene of a large but mysterious explosion. In a shabby apartment complex, they discovered Anton Ferdiantono, a father of four, holding the detonator for a bomb that had killed his wife and one of their daughters. Counterterrorism forces shot him dead. The police said Mr. Ferdiantono had mistakenly triggered the bomb, which was meant for a future attack in Surabaya and was composed of a highly volatile compound, TATP. That explosive has been widely used in Islamic State-supported terrorist plots around the word, and was also used in the bombs that Mr. Oepriarto and his family set off. Then on Monday morning, a family of five squeezed onto two motorcycles and drove toward the police headquarters in Surabaya. In front of the police station — a symbol of the secular Indonesian state — they activated two bombs. The parents, Tri Murtiono and Tri Ernawati, died, along with their two sons. The couple’s 7 -year-old daughter, who was sandwiched between her parents on the motorcycle, survived. As smoke rose from the epicenter of the blasts, she shakily rose from the ground and tottered forward, like a phantom in her billowing white headdress. In little more than 24 hours, three families in Surabaya had been transformed into agents of death. All three fathers had attended the same extremist Quranic recitation group, according to the East Java police, and on occasion they brought their wives and children with them to the indoctrination sessions. The violence was all the more stunning because the families’ lives were woven into the fabric of their multicultural communities in Surabaya, a bustling port city with a vibrant Chinatown and places of worship for various faiths. None of the three mothers wore the niqab, the Islamic head covering that obscures all but the eyes. One of the fathers ran a door-frame business, while another sold watches online. But camouflage was the point, especially for Mr. Oepriarto, who hid his leadership of Jamaah Ansharut Daulah from neighbors, childhood friends and business associates. He and his wife constructed a model of modern existence in Indonesia: the ethnically mixed neighborhood in which they lived, the private school their children attended that stressed racial harmony, the friendship with people who believed in other gods. Ahmad Faiz Zainuddin, who went to the same elite public high school in Surabaya as Mr. Oepriarto and briefly attended the same extremist prayer group, said that such integration was inculcated early and deliberately in potential recruits. Mr. Zainuddin said that he had left the group after being disturbed by its teachings, but that he had stayed in touch with some people he had met there. Mr. Oepriarto, the son of an architect and the oldest of three surviving siblings, grew up in Surabaya. The family was from aristocratic Javanese stock, but neighbors said Mr. Oepriarto never bragged about his blue blood. For decades, one of Mr. Oepriarto’s closest friends on the lane was Hanna Ningsih, an ethnically Chinese Pentecostal Christian who ran a printing business out of her house. Even though Mr. Oepriarto never finished his diploma course in marketing management, he was interested in start-up businesses and found a kindred spirit in Ms. Ningsih, she said. Mr. Oepriarto persuaded her to join Amway and introduced her to another multilevel marketing scheme involving Chinese herbal supplements. Ms. Ningsih helped sell products from his latest business venture: soy milk, white pepper or herbal oils. Even outside his leadership of Jamaah Ansharut Daulah, Mr. Oepriarto was good at gaining converts. Dendri Oemiarti, one of Mr. Oepriarto’s sisters, said all she could do was apologize for the terror unleashed by her brother and his family. Looking back, some saw small signs of a disconnect in Mr. Oepriarto’s life, but they gained import only after Sunday’s massacre. Eight years ago, Arnoldus Jondo, a Catholic neighbor, helped the community construct a Muslim prayer hall because, he said, that is what good Christians do in Indonesia. In recent years, Mr. Oepriarto had distanced himself from his parents and sisters, said friends and acquaintances. He was never close with his wife’s relatives, prosperous factory owners who disapproved of the marriage. Instead, he lavished attention on his immediate family. This closeness could explain Mr. Oepriarto’s decision to bring his children into his deadly plot, said Haula Noor, an Indonesian who is working on a Ph.D. thesis at Australian National University on the family context of jihadists. Mr. Oepriarto’s family gave little indication of what they were about to unleash on Sunday. Shortly before the attack, the couple went to a residents’ association meeting on paving a nearby road. They continued to give their neighbors cakes and cookies. On Friday at her liberal private school, which offers classes in hip-hop and Chinese martial arts, Famela, the youngest child, took her examinations for entering the next academic year. She will never make it to third grade.